Do you live for continental breakfast and mints on your pillow? Earn complimentary stays and room upgrades at your favorite hotel chain with a hotel credit card. Like to hotel hop? If you aren't loyal to one hotel brand, consider a flexible travel rewards card that lets you redeem points for hotel expenses. We researched and analyzed 42 hotel cards and 300 general travel credit cards to find you the best recommendations - here are the 10 best hotel credit cards from our partners. See the best hotel rewards credit card offers from our partners below. If you aren't loyal to one hotel brand, consider a flexible travel rewards card that lets you redeem points for hotel expenses. A great hotel card can help you log free hotel nights, add a touch of luxury to your hotel stays and even take the stress out of travel with convenient perks and upgrades. Many hotel cards combine generous rewards programs with ample perks for loyal guests. What are hotel credit cards and how do they work? Can hotel credit card points be used for flying? Whether you are wondering how hotel cards work or you want to know who should get one, we can help. Hotel credit cards are often co-branded cards (but not always). That means they are issued by a bank, such as Chase or American Express, and partner with a specific hotel brand. As you can imagine, the hotel card will reward you for loyalty to that brand, as well as reward you for loyalty to airline and car rental partners. In some cases, you are rewarded for using the card on general-purpose purchases, such as grocery stores, gas stations and restaurants. Other cards, such as the Capital One Venture cards, also reward for hotels. However, they are not associated with a specific brand. Instead, in the case of the Venture cards, cardholders earn 10X miles when booking and paying through hotels.com/venture. Typically, hotel credit cards come with sign-up bonuses, ongoing rewards and special benefits, depending on the category of membership that you qualify for. Then, the rewards programs usually offer a different redemption amount depending on the category of hotel property you choose. For example, a Category 1 Marriott property requires 7,500 points for a one-night stay, while a Category 7 property runs 35,000 points. There are 2 types of hotel credit cards, co-branded cards and general-purpose cards. Each has its advantage. Co-branded cards. Most hotel cards, called co-branded products, are aligned with specific hotel companies, such as IHG. These cards reward you for loyalty to specific brands, giving bonus points for spending at properties and sign-up bonuses in the hundreds of dollars. In many cases, the brand will have partnerships with airlines or other companies that you can benefit from. General-purpose cards. Some travel cards reward you for a variety of spending that you can use on a number of airline and hotel brands. In some cases, your points are boosted for using a travel portal operated by the card issuer, such as the Chase Ultimate Rewards portal. For example, with the Chase Sapphire Preferred, you get an increase of 25% and with the Reserve, you get an increase of 50% on your points when you book through the portal, which makes it worth a look. 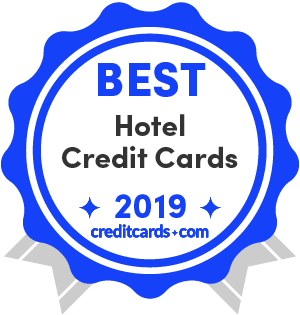 After analyzing over 40 different hotel rewards credit card offers (and even more general travel cards), here is our list of the 10 best hotel credit cards for 2019. The Capital One® Venture® Rewards Credit Card tops our list because of its generous 10x miles when you book and pay at hotels.com/venture. For a co-branded hotel credit card, the Hilton Honors American Express Ascend Card is our top choice. Earn 50,000 points after a $4,000 spend within the first 3 months; 3X points for travel and gas; and 2X points for restaurants and entertainment. One thing to note: Those 50,000 points become $625 when booked through the ThankYou Travel Center. Bottom line – While the Citi Premier Card is second to the Venture Rewards in annual rewards value due to the latter's hotel.com/venture feature, the Citi card's value is still strong with its generous tiered points system. Earn 50,000 miles after a $3,000 spend within the first 3 months, equal to $500 in travel, and enjoy the flexibility of staying at any hotel at any time. Bottom line – The Capital One Venture Rewards now has a bonanza offer on hotels with 10X miles toward purchases made with hotels.com/Venture. That and the 2X miles on all eligible purchases make this card a superior general-purpose hotel card and one of the best credit cards for travel. Venture Rewards partners with 14 major airlines, allowing you to transfer your miles. Earn 60,000 points after a $4,000 spend within the first 3 months, and 2X points on worldwide travel and restaurants. But it's the flexibility in rewards that makes it stand out from its competition. Bottom line – The Chase Sapphire Preferred is at the top in flexibility, with a 25% bonus on bookings through the Chase Ultimate Rewards portal, and 1:1 redemption on many travel partners. While you can earn 20,000 miles after a $1,000 spend within the first 3 months, and earn 1.25X miles on all eligible purchases, it's the hotel rewards that are the most impressive. When you book and pay through hotels.com/Venture, you can earn 10X points on bookings at thousands of hotels. Bottom line – The Capital One VentureOne Rewards comes in close behind the Sapphire Preferred in rewards flexibility, with travel without blackout dates and stays at any hotel at any time. With the outrageous 10X miles offer on hotels, this card is a keeper. Earn 30,000 points after a $3,000 spend within the first 3 months, as well as 3X points for travel, dining and transportation. New on the market, this card has quickly grabbed the attention of points chasers. Bottom line – The Wells Fargo Propel American Express offers exceptional rewards for hotels, flights, homestays and car rentals – making it a favorite for travel features. You might think earning 125,000 points after a $2,000 spend within the first 3 months of card membership will be as good as it gets, but there's so much more. Earn 12X points at participating hotels and resorts in the Hilton portfolio; 6X points at U.S. restaurants, U.S. gas stations and U.S. supermarkets; and 3X points on everything else. Bottom line – The Hilton Honors American Express Ascend Card is just full of surprises, including a weekend night reward after spending $15,000 in a calendar year, and upgrade to Diamond status after a $40,000 spend in a calendar year. And unique to this card – your non-hotel spending is mightily rewarded. The 100,000 points earned after a $5,000 spend within the first 3 months is lower than the Ascend with a higher required spend, but there are rewards galore to make up for it. There's the free night every year after your account anniversary; 6X points at participating Marriott Bonvoy hotels; and 2X points on all other purchases. The annual fee is $95. Bottom line – While the Marriott Bonvoy Boundless has a lower rewards value than the Ascend, it still offers excellent rewards for the Marriott enthusiast. This card offers 25,000 points after a $1,000 spend within the first 90 days and 1.5X points on all eligible purchases. You can also earn a 10% points bonus on every purchase when you have an active Bank of America checking or savings account. Bottom line – The Bank of America Travel Rewards' no annual fee, straightforward redemption and easy earnings make it a smart addition to your wallet. Earn 80,000 points after a $2,000 spend within the first 3 months, plus an additional 40,000 bonus points after a total spend of $5,000 within the first 6 months; 10X points at IHG hotels; and 2X points at gas stations, grocery stores and restaurants. Also get a free night every anniversary. Bottom line – The IHG Rewards Club Premier offers bountiful points and is a standout in hotel options and features, with more than 5,200 properties, room upgrades, vast types of travel insurance and the famous free night after a stay of 4 or more nights. Earn 75,000 points after a low $1,000 spend within the first 3 months; 7X points at the Hilton brand; 5X points at U.S. restaurants, U.S. supermarkets and U.S. gas stations; and 3X points on all other purchases. While its points are not as rich as the Ascend, there is no annual fee. Bottom line – With the 5th night free for every consecutive stay, a 15% bonus on Honors points, and express and late check-out, the Hilton Honors American Express offers hotel options and features second only to the IHG Rewards Club Premier card. Hotel credit cards are great for loyalty, whether with a specific brand or its partners. Depending on your category of membership, hotel cards and loyalty programs often offer benefits such as early check-in, late check-out, breakfast and more. There are a number of advantages to these cards, including generous sign-up bonuses, but there can be some downsides as well. As with other credit cards, hotel cards can help you build credit. Hotel cards are especially great for brand-loyal travelers. They often feature generous rewards and sign-up bonuses. They also often have nice benefits and perks to enhance your hotel stays. As with other credit cards, hotel cards can negatively impact your credit if you pay late. With some hotel cards, you are limited in how you can redeem your rewards points. Rewards points may not be worth as much as their nominal value suggests; take care to research point valuations. Many hotel cards require an annual fee and/or a high annual spend in order to enjoy the card's benefits. Getting rewarding benefits. David Bakke of Money Crashers points out that the big advantage of hotel credit cards is the rewards program. You can earn everything from points good for purchases and statement credits to free nights and room upgrades. Finding a strong sign-up bonus. Many of the available hotel cards offer sign-up bonuses in which you spend a certain minimum within a specific amount of time, usually 3 months or 90 days, and in return, you earn thousands of points, which can be worth hundreds of dollars. Enjoying credits for other brands. As Bakke points out, some hotel cards allow you to convert points into credits for flights as well. Great for loyalty. If you have a favorite hotel brand, it's worth your while to look at hotel cards, because with them, you can earn excellent bonus points toward the brand, as well as the benefits we mentioned. Paying an annual fee. Most hotel cards have an annual fee, which you need to be aware of, because if you don't pay full attention to your spending and earning, you can actually end up spending more than you save. Finding that the card is of limited use. Bakke points out that some cards' rewards are only good at the brand's hotels, limiting how you use the card's points. A hotel card may not be the best choice if you aren't supremely loyal to a single brand, in this case. Varying points valuations. It may not be readily apparent how much your card's points are worth. The Points Guy looks at points valuations for the different brands that will help inform your decision. Carrying a balance. If you carry a balance, you defeat the purpose of a rewards card. Plan to not pay in full each month? Don't get a hotel card. Also, it can impact your credit score if you carry too high of a balance. An incredible 40% of cardholders have always used the same card or haven't changed cards in at least 10 years, our March 2018 survey shows. That's a lot of points, miles and cash we are leaving on the table, including those from hotel cards. When consumers did switch, it looks like it was for the right reason, with people on the hunt for rewards at the top of the list. If you make the choice to transition to a rewards card, keep in mind that with the right hotel card, you can maximize points through business and personal travel alike. Also, they are worth your while if you like to play the points game. Wondering if a hotel credit card is right for you? If you are one of these 4 types of people, they might be a good choice. If you travel often for business. With the right hotel card, you can maximize your savings by pulling the card out whenever you travel on business. If you have a favorite hotel brand. If you are loyal to say, Hilton, then look at the Hilton cards that are available to see which one suits your travel habits best, such as the Hilton Honors suite through American Express. If you enjoy playing the points game. Hotel cards are great for people who like to take full advantage of rewards programs. Hotel cards come in a choice of flavors, with widely varying benefits, different point valuations and differing expiration rules. Curious how to make it work for you? Here, we look at the different factors to consider, then we compare hotel cards as an example. Here are top factors to consider when choosing a hotel credit card. Which is easier to earn points with? Daniel Wesley, of Credit Loan, points this out – study your spending habits to decide which card you are more likely to use. Which has fewer restrictions? Wesley notes that you need to be mindful of restrictions on usage as well as points redemption. What are the expiration rules? Hotel rewards programs vary in their expiration rules, starting with 12 months and going even to 4 years. Make sure they are requirements that suit your lifestyle. What about benefits? Hotel cards often offer features that are not apparent at first glance. For example, you might be able to get free breakfast for two or free late check-out. Do the annual fees outweigh the potential perks? If so, don't get the card. How useful are the rewards, really? Look at whether you are really going to have an opportunity to redeem the points, says Wesley. Be sure to compare the sign-up bonus, as well as the ongoing rewards. Am I familiar and comfortable enough with one hotel chain over the other? Look at which brand you are most loyal to, says Wesley. What are the points actually worth? Yes, 100,000 points seems like a lot, but you need to look at the cards' points valuation to compare apples with apples. The Points Guy's monthly points valuation assessment can help. As you can see, the Hyatt card is the clear winner because of a superior point valuation – that's even with the Hilton card's special intro offer. Bottom line: Make sure you look at all of the moving parts of the cards you are eyeing before making a decision. Look at your travel habits. Do you have a favorite brand? How often do you use it? If you love the Hilton Portfolio, then go with that. If you are open to options, look at which brand is prevalent in the areas where you tend to travel. What are the benefits? When choosing a hotel card, look at the different membership tiers, what they offer and ascertain which one you can realistically meet based on your travel habits. This will help you decide whether you prefer the complimentary lounge access of SPG or the 48-hour room guarantee of Hilton Honors. Take a look at the annual fee. Many hotel cards have an annual fee. You'll want to make sure that you will surpass that fee each year with your rewards. Keep in mind that some cards waive the charge the first year. Make sure you comply with the sign-up rules. Hotel cards typically offer a one-time sign-up bonus in exchange for a required spend. Don't let that deadline pass you by. Put big purchases on it. Planning to get some work done on your car? Pull out that plastic and enjoy such rewards as 3X Hilton Honors points with the Hilton Honors Ascend from American Express. Keep in mind that you may get a better deal with a different card in your wallet that has a flat rate, such as the Barclaycard Arrival Plus World Elite Mastercard. Pay monthly bills with the card. Look at which card is best for such recurring purchases as cellphone charges and utilities. Typically, points for hotel-brand loyalty programs can expire if you don't keep the account active, but there are a number of ways to make sure that doesn't happen. For example, you can use a co-branded credit card that earns hotel points, you can transfer points from the American Express' Membership Rewards program for Best Western, Choice, or Hilton, or do the same from Marriott, Ritz-Carlton or Priority Club. By transferring your hotel card points to an airline partner, you can fly with those points. But do your homework, because the transfer may not be the best you can get. That said, there are advantages to marrying airlines with hotel cards, such as bonuses for points transferred and points earned for airline tickets purchased. Ideally, check the hotel brand's partnerships if that's a deal-breaker for you. Recently, Marriott International's acquisition of Starwood Hotels & Resorts formed the largest hotel company. With it, Marriott began matching member status across Marriott Rewards and Starwood Preferred Guest, as well as The Ritz-Carlton Rewards. This means you can spend and redeem at 6,700 hotels across 30 brands in 2019. Marriott has made it easy, allowing you to have one account, one login, one profile and one points balance. And when you are an Elite member, you will be able to see your Elite status and all the benefits you get in a single account. To achieve this, you'll want to combine your accounts into a single account and profile. With this action, you might achieve a higher tier. Your nights dating back to Jan. 1, 2018, will be counted. Also, when your SPG and Marriott are combined, your lifetime activity will be also combined. There will be new redemption opportunities, including Marriott's new free night award chart. You'll be able to transfer points to more than 40 airlines, and starting in August, Marriott will add 15,000 points for every 60,000 points transferred to airline miles. For more information and to see more cards, see our hotel credit card reviews.